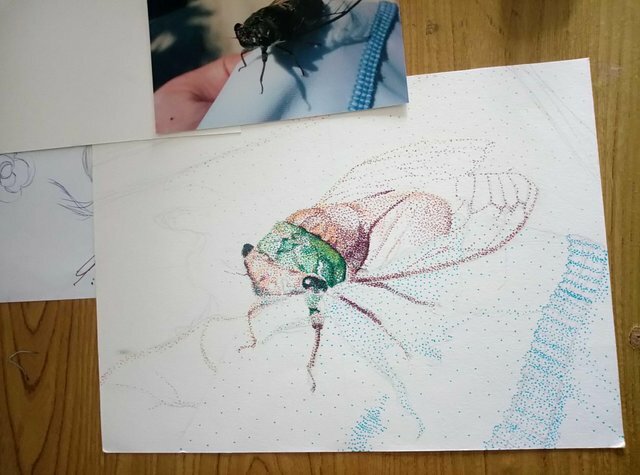 This is my first pointilism in.... 20 years? Wow, I came far already! First time I did in art class back in junior high school. Still remember, an image of monarch butterflies from National geographics magazine done with color marker pens. I did fine and liked it. So I was doing another one from wild wolf calender with very fine 0.05mm... It never ended, hahaha. At that time, there was the art education fair for higher education and I took this wolf pointilism with me in portfolio to talk to art teachers from different universities. 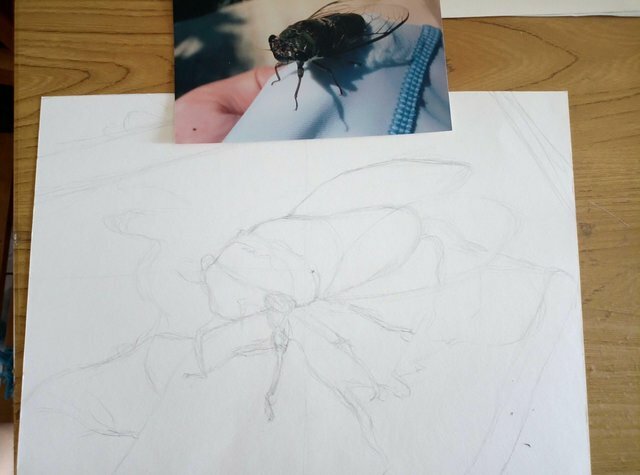 So one striking thing been told by one of the teacher was, that the image for this kind of art which recreate realistically, got to be originally taken by artist themselves. This is for the sake of originality. If you want to transform it ito something else and very little resemblance of original image, then there is no issue. So I am no photographer.... I just dropped doing any realistic drawing ever since. I focused on still-life and illustrations. Anyway, I am struggling to recover from good friendship brokeup incident since last month, looking for healig and relaxation. Wanted to give pointilism a shot once more! I went over my album and found this cute cikada photo I took about 10years ago, in Pulau Manukan. My family was having fun at the pool and this fella flew to me! I always have soft spot for bugs❤️. First day, I drew lines lightly with pencil. 2nd day, dotting with light colors. Well... The marker pen set has only 20 colors so lightest was bright yellow! Then bright yellow orange, bright yellow green too hehehe. What can I expect hehe. Looking totally like an alien, look at it's face! Size A4 and doing this in kid's marker pen. Will be updating in few days again. The artworks on this post is done and take by me, @namipangolin. Hi @naomipangolin, I'm @checky ! While checking the mentions made in this post I noticed that @namipangolin doesn't exist on Steem. Did you mean to write @naomipangolin ? 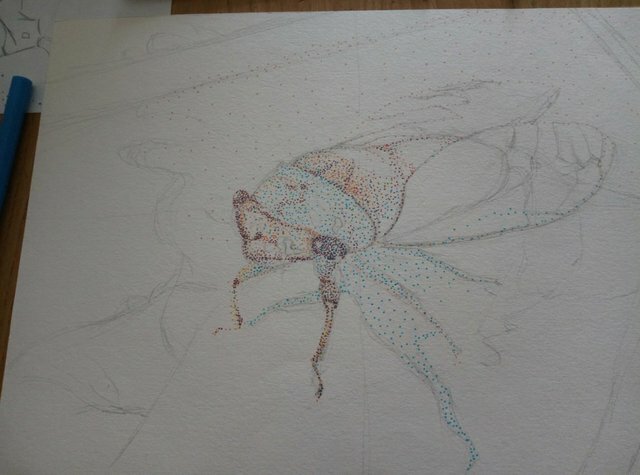 Pointillism requires a lot of patience which I do not have... I look forward to seeing how it progresses.